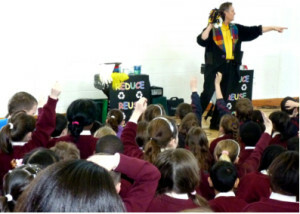 Recycle Magic is fun education program that promotes caring for our environment by recycling and anti-litter. The program has been performed to thousands of primary school age children in schools, theatres and community centres throughout the UK and Ireland. Recycle Magic has been part of environmental initiatives and has featured in Waste Fairs, Eco Projects and Anti -Litter campaigns, receiving positive comments from teachers, students and environmental education officers. 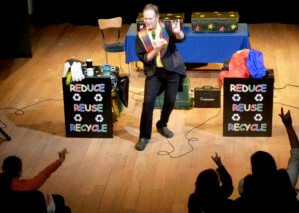 Over the years Recycle Magic has featured regularly in the Sligo Science Fair and the Belfast Waste Fair. It has also been performed at the Mayo Science Festival, Dublin Eco Week and Picnic in the Park at the Botanical Gardens, Belfast. The program approaches environmental responsibility in a fun way whilst covering important issues such as global warming, air, water and noise pollution.